As a respectable thirty-something wargamer, I pride myself on using what little time I have to effectively discover the ins-and-outs of any strategy game I play (and I do make the time, even if sleep loses out). I tend to ignore the manual until later, and send the CD right into the drive, install, and away I go. With BCT Commander, I made my way through my first game with the grace and elegance of an M1A2 Abrams threading its way through rush hour traffic. In short, I fell on my face. Is that necessarily a bad thing? Well, when a game has enough power to overwhelm a gamer like myself, handing out a face-slapping in the form of its raw, detailed play, it is indeed something positive. This game mademe blink, stand up and dust myself off, and actually sit down and readthe manual. BCT Commander puts you into the fatigues of a United States Brigade Combat Team commander, with the privileges (having the satisfaction of crushing the enemy) and responsibilities (organizing your troops on the ground, moving them, and supporting them). The entire BCT concept is centered on the idea of making a brigade-sized team the central unit behind a deployment to “hot spots” around the world. Simulating the JANUS battalion/brigade tactical simulator that the U.S. Army employs, a thoroughly detailed simulation of high mobility movement and hard-hitting firepower is here for your use. This product is not for the casual strategy gamer/wargamer, although it may provide them a shot of serious, realistic action as a break in their routines. This product is not for the casual strategy gamer/wargamer, although it may provide them a shot of serious, realistic action as a break in their routines. It will definitely appeal to anyone looking for realism in his or her games. Because it was designed by an active duty U.S. Army officer (CPT Patrick Proctor, Field Artillery), the player will find everything here that pertains to military operations, including artillery support, air strikes, mine laying and clearing, obstacle breaching, small arms, and much more. 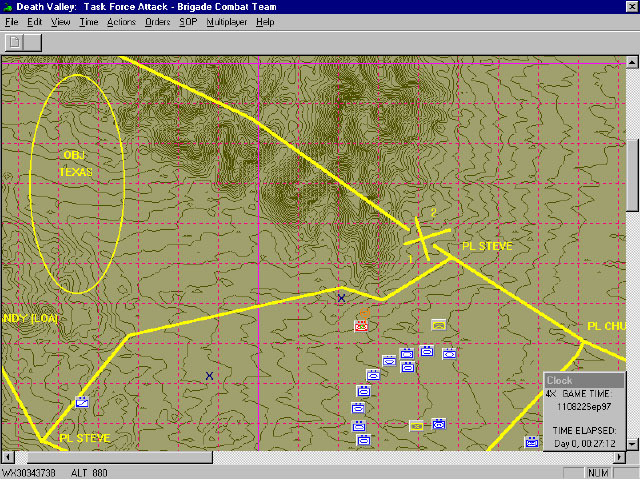 The map is 3D, but rendered in 2D in a top-down mode; units are represented by either small square counters with the appropriate NATO unit symbology, or can be toggled to have a “silhouette” of the main vehicle of that unit (like a tank for a armored unit). Units can use terrain to their fullest advantage, taking the high ground to spot for artillery, or taking a hull-down position on the crest of a ridge to give an unwary enemy a nasty surprise. The digital elevation model (DEM) used in the game is the same as is used in the JANUS simulations; contour lines render the elevation levels of the land, while other terrain (such as trees, urban environments, and the like) is shown abstractly by standard U.S. Army map designations. In all, it is a very clear and easy to understand environment. Distance is one kilometer per square, and a pink box designates an area of 10 square kilometers. Time can be run either real-time (one second of game time equals one second of real-world time), or sped up to two, four or eight seconds per real-world second. The player will face a variety of missions, traveling to the sun-blasted training grounds of Nevada, to the mountains of North Korea, and even to the crags and caves of Afghanistan. The ProSimweb site states that “the ability to play BOTH sides of a given conflict” is a feature of the game, but sadly, I was never able to figure out how to do so, although there is the capability to play either side in multiplayer mode. In the meantime, gamers who like to beat up on computer opponents will have enough on their hands to keep busy for a long, long time. BCT Commandertakes its cue from a large and loyal following of wargamers, who have let their desires and inputs be heard via message boards and feedback, and ProSim listened. This package is more than just the original BCTgame; it has 12 new scenarios (on top of the older ones), a Construction Set, both expansion packs previously released for the original BCT, and the JRTC Special Edition, a collection of additional scenarios made exclusively for the Joint Readiness Training Center at Fort Polk, LA; almost no commercial owners of the previous BCTgame have access to this last item. 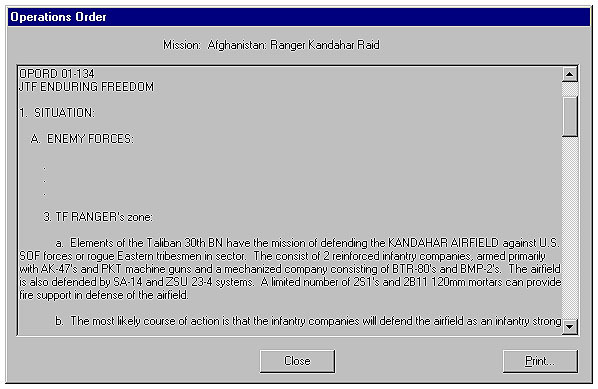 The game comes with many scenarios, some of which are based on actual US Army training situations; others are re-creations of battles (such as the Afghanistan raids conducted by the Rangers in October, 2001). None of the battles are interconnected, however. A lack of a campaign mode is painfully lacking here. Being able to command a group of units through various battles while struggling with resupply and reinforcement issues would have been a delight and a logical all-around finish to BCT Commander’s design. The number of scenarios coupled with the ability to design your own helps offset a lack of a campaign mode somewhat. Each scenario comes with a detailed OPORD (operational order) that spells out in detail your forces, your objectives, what is likely to get between you and victory, as well as other minutiae that adds to the entire experience. My immersement in the game was complete at this point, and anyone with any military background will identify easily with the formats and reports used by BCT Commander. Anyone not familiar will have his or her sources, including documentation on the CD, that will help even the most un-informed grognard (is there such a thing?) get up to speed. The various OPORDs won’t leave much to the imagination. A minor error occurred when I installed BCT Commander. Specifically, the game flashed up an “Internal Error 2803: Files In Use” about halfway through the short two-minute process, then just as quickly the dialogue disappeared. Resigned to the possibility of having to delete the game from my hard drive and attempt a re-install, I was quite happy to find that the product works absolutely fine with no crashes or other perceptible errors despite this error message appearing. According to the Shrapnel Games web site, its support software “allows [them] to work fast and efficiently to benefit you.” I had no previous experience with their customer service, andknew I had to test them out, no matter how minor the problem may seem. As a reviewer, I almost hope for just such an occurrence with every game I review to get a chance to test out customer support. I contacted ProSim with my question on a Wednesday evening, and within 24hours Richard Arnesen rested any concerns I had about this error message. Not a bad turn-around time, especially for a minor issue. One of my problems with BCT Commander lay with the physical manual. Even though I tend to ignore game documentation at first, I always go back to the docs for the games I enjoy. However, with 119 pages of material to go through, this ends up being a large meal to digest. Shrapnel Games decided to go with a font that borders on a 4-to-6 point size; if you have problems with small print, you will likely need some kind of visual assistance reading this book. My advice is to pitch the manual (or shred it for bird cage lining) immediately, as it is a very difficult read. Also glaringly obvious is the lack of decent-sized screenshots throughout the manual to show examples illustrating the text. The pictures use a gray scale, so it is difficult to see them to begin with. (The accompanying ‘helpful’ callouts that appear on the pictures to illustrate certain points are white, and nearly impossible to see in some cases). What’s worse are screenshots that are no bigger than 0.48 cm2 (roughly 5/16”). Examples of the menu bar icons are even worse; try squinting at a picture no larger than two millimeters on a side, and you’ll have a headache in no time. Larger fonts and and screenshots would have been most welcome. Couple these gripes with poor grammar and spelling throughout, along with mislabeled examples (one shows words diagramming an example screenshot, already hard to read, with their accompanying arrows about a half inch farther over than they should have been), and you have a pretty miserable excuse for a manual. It is terribly obvious that little or no proofing went into this book. Especially helpful is the presence near the end of the book of a small collection of modern military equipment. However, a full manual included on the CD remedies most of the above (although not the writing quality). The document on the CD is exactly the same as the hard copy itself, and it is much easier to read the maps and icons in this electronic doc than it is otherwise. However, the only way you will discover that is by clicking “Browse CD” from the BCT Commander main screen that appears when the CD is popped in. If you like physical manuals, you’ll have to print this one out. In spite of the poor presentation, I found a treasure trove of information in the documentation that will help even the most uninformed wargamer get a grasp of the basics of modern land combat. The tutorial in Chapter Two, however, misses out on some important points (such as telling one how to start moving your units; it details movement well enough but didn’t state how you would get them moving). The rest of the manual adequately helps the uninitiated learn the basic lingo, phonetics, and other confusing things (to uninformed civilians, anyway) that make up military parlance and procedures in battle. Especially helpful is the presence near the end of the book of a small collection of modern military equipment. I’ve heard of the M1A2 Abrams (who hasn’t? 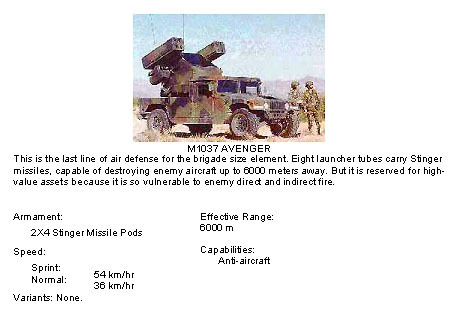 ), but never of the M1037 Avenger (a Hummer equipped with eight Stinger missile tubes). It’s nice to get a little background on some of the equipment that you’ll be controlling, and the pictures are even large enough to look at without squinting. A quick overview of the various vehicles is included in both the electronic and physical documents. 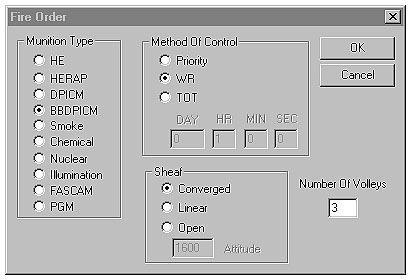 Finally, for those of you who can’t get enough of military-speak, I wholeheartedly recommend you look at FM 101-5-1/MCRP 5-2A Operational Terms and Graphics (downloadable with Adobe Acrobat Viewer) for material that will put you into the throes of detailed acronym and symbol ecstasy. Also, this manual is thoughtfully available on the CD itself, saving you the trouble of having to download it once you purchase it. The game is not flashy, and you’ll find no mind-blowing 3D graphics ripped by powerful modeling engines here. 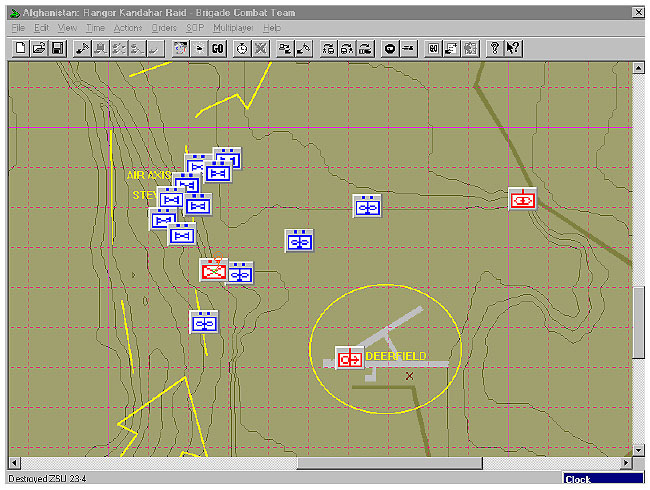 Instead, you’ll see what any staff group would study back at headquarters: a rendered map of the battlefield with small counters sporting NATO designations (you can toggle the units to actual unit silhouettes, such as tanks, but they’re too cartoonish) moving about the map among the various terrain and numerous baddies. There’s no satisfaction watching an enemy APC brew up in a glorious fireball of death; just an ignominious “X” to mark the spot of the demised pieces of hardware. No dust clouds streaming by as your M1 tanks blaze across the landscape at high speeds; just square unit counters crawling along. Even with the lack of fancy graphics,I found myself using somethingI haven’t used in a lot of games lately: my imagination, which is what got meinto boardgaming in the first place. The game sounds are adequate, sporting the normal machinegun, cannon fire, artillery strikes, and the like, with little in the way of surprises. In fact, you will learn the sounds relatively quickly, which is very important. For example, when your artillery lets loose with a barrage, all you get on the receiving end is a tight pattern of small dark red circles. Without the sound, you’d easily miss the impacts. Otherwise, it is very easy to get bored with the sounds once you’ve heard them dozens of times over (which is a good possibility even after only one scenario). The game is solely mouse-driven, sometimes devolving into a frustrating click-fest as you scramble to issue orders, pause the game, call for artillery support, move units to react to a fluid battlefield…the possibilities are endless—unlike the strength of your tired clicking finger after a few rounds with BCT Commander. Information on your units can be had by hovering the mouse over them: orders issued by right-clicking,and status changes by further right-clicking or left-clicking.The orders menu has a plethora of push-buttons to choose from along a toolbar at the top of the screen. Groups of units can be selected by left-clicking-and-dragging over the units you wish to capture and can be grouped together by using a SHIFT + number command, so that they can be easily recalled by pressing the number you assigned them to. Hueys carrying Rangers assaulting the airport (Obj. Deerfield) near Kandahar, Afghanistan, with F-14 Tomcats leading the way. Now where did I put my copy of Wagner’s “Flight of the Valkyries”…? Players will have what every commander in a real battle would wish for: a chance to pause the action, giving one time to think over the situation and react accordingly. Such a tool in a game is obvious, if overlooked sometimes, and it’s a good thing it was included in BCT Commander. “On the road again…” Note that the units are on their smallest setting; you can increase their size to the point where you could see them from across the room. A close-up view of a portion of a battle. 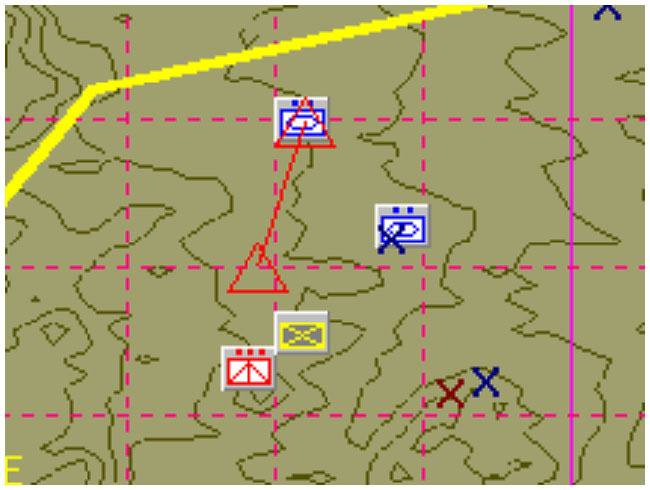 Note the up-pointing red triangles mean “move,” so the US Tank unit will be moving shortly to close with the enemy ATM team (brave guys). 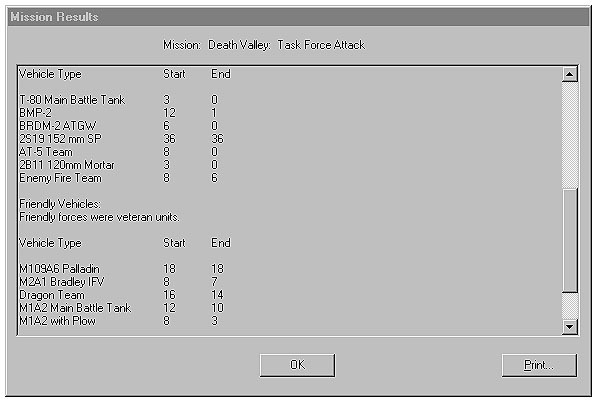 Units are represented by sections, and vary by unit type ( one counter of armor represents two tanks, while six Paladin self-propelled howitzers are represented by one counter). Each can be represented by standard NATO symbology, or by unrealistic ant-like silhouettes. I recommend using the NATO symbols. U.S. units feature blue on white backgrounds, while the enemy is red on white—much easier on the eyes, and easier todistinquish compared to the icon-represented units. You can’t ask for much more flexibility from your artillery. Even one loss is too many for your US forces, but the Soviets suffered more here. Combat is automated, meaning the AI fires your units for you. Once your units are in range and have a clear field of fire to the target (not to mention ammunition…oh, by the way, did you remember to bring up the ammo carriers? ), they will blast away. Unfortunately, little if any representation is made on the map to show an ongoing battle. The player will have to rely on sound (a tricky proposition as one set of guns pretty much sounds like another), or run the battles at the slowest speed and checking your received messages constantly; these will pile up quite quickly in a pitched battle, and anything but slow speed will resign your units to piecemeal destruction most of the time. Other environmental hazards, besides battle management, include breaching anti-tank ditches and minefields, which the AI is quite good at laying out. M1 tanks with special bulldozer attachments become indispensable, as do engineering units, and protecting them in some scenarios means the difference between victory and defeat. Smoke is also used effectively by the AI, and is another tool you will use to help hide you on the battlefield. Quite often in modern combat, the first unit to die is the first unit that is spotted. Survivability is doubtfulwhen going toe-to-toe with an enemy, so maneuvering is the key to keeping your casualties low while using your other assets, such as artillery and air strikes. The AI runs the enemy forces arrayed against you, and also takes care of firing your units. That’s right – no ‘Fire’ orders for you to worry about here (except for the ‘Fire Mission’ order for your artillery); the AI will automatically allow your units to engage the enemy (and vice-versa) when they are in range. From what I found, the AI is extremelycompetent, making full frontal assaults completely foolish (as they would be in real life). The AI makes excellent use of covering terrain and appears at the worst possible moment to ambush your men. Your units will blindly follow their movement orders, reacting to enemy units only by firing at them; a few times my units halted when faced with serious firepower. Otherwise, strangely, my units brazenly ignored enemy units. This can prove to be a problem, as your first-echelon units tend to pass by strongpoints, leaving them to ambush your weaker rear-echelon follow-up forces, such as M2 Bradley infantry fighting vehicles, engineering equipment, and artillery. Caution and attention are two watchwords you cannot afford toignore. The AI doesn’t seem to have a problem communicating among its own units; careful attention to conducting your own scouting missions (as well as looking out for the enemy’s scouts) must be taken in order to gain critical advantages. Letting the enemy get scouts behind you to get a fix on your rear-area units, and you can expect an artillery assault soon afterward. ProSim gives BCT fans everything they could possibly want in terns of replay value: more scenarios, tweaks and expansions make BCT Commander a product that would, according to Captain Proctor, cost approximately $100 if purchased separately. Now that BCT Commander is here, you get all this at less than half the cost. The support community for the original BCT is astounding, and Captain Proctor gives much credit for the development of the game to the players who submitted their observations and suggestions. Modern combat free-for-alls are available between two human players via BCT Arena, which is an option that can be chosen from the BCT Commander menu under ‘Start.’ When this reviewer attempted to access the site, a “page cannot be displayed” message appeared. The reviewer also attempted to start an Internet game through the BCT Commander main menu, but after selecting “Start a New Game” and going through all the required steps, the game froze and then exited, all within a minute and a half. Next, I tried “Find An Opponent” from the main menu; again, the game froze without finding the site. The reviewer was already connected to the Internet via America Online, so perhaps the error was simply that the site was down. Nevertheless, it was a frustrating experience. The usual network connections are supported here as well, allowing a game to take place by way of IPX, LAN, and serial port. Both players must have the same scenarios on their computers in order to play them. BCT Commander is a title worthy of serious consideration by any die-hard wargamer looking to add to his library, or anyone into a more modern era of wargaming; if boardgames such as Third Reich or Advanced Squad Leader felt just a “little too unrealistic” for you, then this reviewer recommends it wholeheartedly. Otherwise, the game degenerates mostly into a click-fest that can be frustrating and annoying for anyone who has little interest in this genre. A player should have the background and/or interest before considering picking up this title. Michael Eckenfels is a technical writer for the IT industry, and when not dwelling in the overwhelming excitement that field offers, likes to admire his dusty collection of just about every board wargame known to man – collected since the mid-1970s. He writes feature articles for several sports web sites, writes occasionally for Games Unplugged Magazine, is an avid computer gaming aficionado (starting on the ancient VIC-20 and working his way up to his somewhat more modern Pentium III), and is a dedicated military historian.